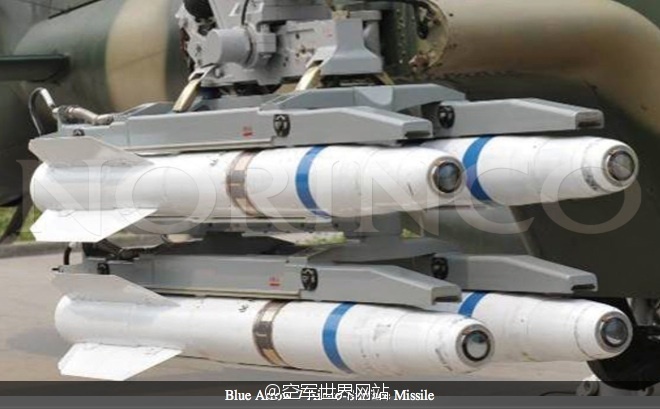 The LJ-7 (LJ = Lan-Jian, meaning Blue Sword) missile is a derivative of a semi-active laser guided HJ-10. The missile has been displayed at Eurosatory 2012 as the Blue Arrow 7. This missile is for anti-tank warfare, armor penetration is up to 1400 mm; it is achieved by increasing the warhead and reducing the fuel, resulting in the reduction of the maximum range. AKD-10 missile(HJ-10) can be carried by WZ-10 or WZ-19 helicopters, or Chinese made combat UAVs. The BA-7 missile is a derivative of the LJ-7, designed by the same developer, the 203rd Research Institute of CASTC. The BA-7 made its public debut on June 9, 2010, when it was first revealed at Wings of Crack Troop—The 3rd Chinese UAV Conference and Exhibition held at the Military Museum of the Chinese People's Revolution. The BA-7 appears to be identical to the LJ-7, but the seeker of the missile was completely covered by a red cap during the exhibition/conference, and thus not shown to the public. The developer has claimed that instead of an anti-tank missile (which the LJ-7 is), the BA-7 missile is an air-to-surface missile capable of being equipped with different seekers, so it is safe to say that the BA-7 is similar to the semi-active laser guided AKD-10 missile, but with a different seeker. Many military enthusiasts have concluded that the seeker of the BA-7 would either be IR or TV, but such claims have yet to be verified by a more credible source when more information about the missile is released.